This is my second message as your President. I'll start off with an appeal for your reading and approval of the changes that have been made by the By- Laws Revision Committee chaired by Joe Dobrowolski. The proposal is now posted on our website, www.fairoakshistory.org, and you will be receiving a copy in the October newsletter for ratification at the annual general meeting in October. Please think about new officers for 2007. A nominating committee will be in place during the July meeting. In order to support our museum we need to think about projects that would raise funds - the Board needs ideas from the membership. In the past we have relied on our dues and raffles for extra money. I would also like to have a membership drive and get our membership up to 200 members. I am in contact with the Sacramento Metropolitan Fire Department, Hook and Ladder Club, and local history buffs on the history of Sacramento area fire departments. I hope to have a program with the fire department history and safety education at July’s meeting. I would like to take this opportunity to thank Chip Fong for sharing his knowledge and information about the Veterans' History Project. Chip is a Naval Aviation veteran. His interest in the personal stories of veterans is helping to add to American’s rich history. Without his dedication and that of many other volunteers, these stories would be lost. Chip served in the Navy for 4 years with Fighter Squadron 92. After his separation from the Armed Services, he went on to complete a 25-year career with the California State Police and the California Highway Patrol. Chip not only devotes his time to the Veterans' History Project but he is also a docent with the California State Railroad Museum. Hopefully, Chip will help with a history lesson on trains for one of our programs in the future. This program on the Veterans' History Project is coming just in time for our veterans and their families. By making themselves available, they can share their personal knowledge about their involvement during World War II and Korea. We need to do this before all of our World War II and Korean War veterans are gone…so that they will never be forgotten. 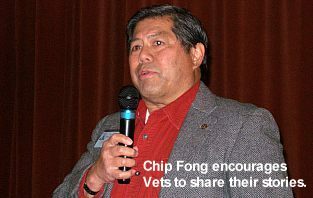 If you have a story to tell, please contact me and I will put you in contact with Chip Fong and the Veterans' History Project. You can call me at (916) 944-4812 or e-mail me at sherrywood1949@yahoo.com. If you have an idea or suggestion for a future program topic, please let me know. I want to bring historical topics of interest to all of you. 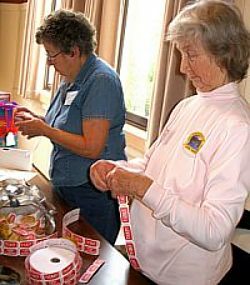 The society has sold many copies of the 2006 Fair Oaks pictorial book. We have only 160 left. Copies will be available at the July meeting for $20.00. 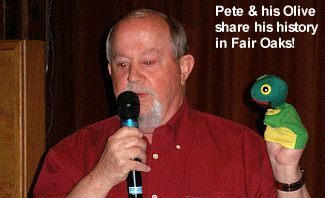 The Fair Oaks Fiesta was on May 6 and 7. The History Center had an exhibit in the Old Library Building with displays of old toys, dolls, quilts, soap making and library memorabilia. Two laptop computers with information about our Historical Society and local photos ran throughout the event. Many thanks to the committee who were responsible for the displays: Larry & Dorothy Huggett, JoAn & Gordon Heidt, Fran Sargent, Rose Ann Lamb, Pete White, Lois Frazier and Jim Pearce. Thanks also to members who were docents helping to answer questions and welcome visitors. 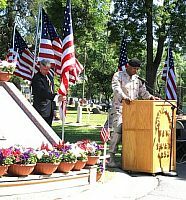 On May 27, the Fair Oaks Cemetery District celebrated its 8th annual Memorial Day . This year they honored the Purple Heart Medal Recipients. 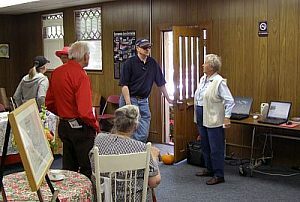 Speeches, music and refreshments were enjoyed by approximately 200 people. 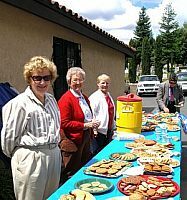 Many people said how they enjoyed all the good cookies donated by our society members. Thank you everyone! The History Center is open every second Sunday from 1:00 to 4:00 p.m. Thanks to the following people who have been docents this year including Diana Lennon, Lois Frazier, Larry & Meg Smart, JoAn & Gordon Heidt, June Melvin plus Warren & Janet McWilliams. If you would like to be a docent, please call Lois at 967-2967. 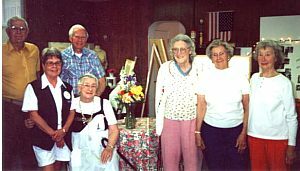 Sadly, Viola May (Stout) Snyder, a long time member of our society and, in days of yore, worked at Stark's Pharmacy, passed away this June 26. She will be greatly missed by her friends and family. The following four entries were submitted to Ray Burmaster, chair of the logo project, who presented them to the Board. They are now ready for your selection and vote at the July meeting. Please join us for this next step. It will be used on publications, stationery and the website. 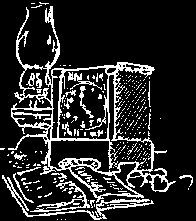 Our newsletter banner will keep its logo designed by the Huggett's son Rand and Iva Langness. 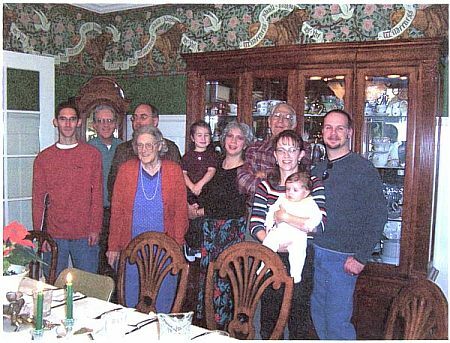 In December 2005, Diana Lennon entertained the Gordon Heidt's and some members of their immediate family for lunch at her home. Gordon Heidt, 4th. from the right, is the grandson of John H. Cunningham. Jo An Heidt, Gordon's wife, is 4th. from the left. Mr. Cunningham came to Fair Oaks from Brewster, Minnesota in l896. He is the builder of the home at 7789 Sunset Ave., of which Diana Lennon is the present owner. Marilyn Dupray on the left, with help from Fran Sargent, has taken over the Ways & Means responsibilities. She may have called you already, or may in the near future, to bring an item for the evening's raffle. The money generated from the donations furthers our organization's programs. She appreciateds all those who have participated! Just for fun: Which F.O.H.S. member has the most "mention" in this newsletter? Jane Whitnack, a Fair Oaks Historical Society member, suggested we seek out this home for our article. 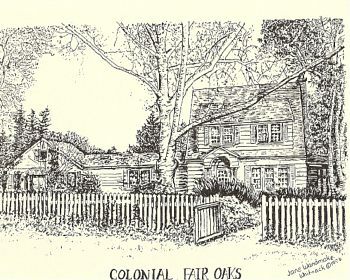 In 1993, she did a series of notecards depicting old homes in Fair Oaks. A sample is the ink drawing above which is the featured colonial home this issue. The present owners, Jess and Nancy Fowler and their three sons, bought the home in 1997. They have made major changes in the landscape including a beautiful swimming pool and terraced lawns. The large lot is canopied with massive oaks. The architecture of this home has been retained. 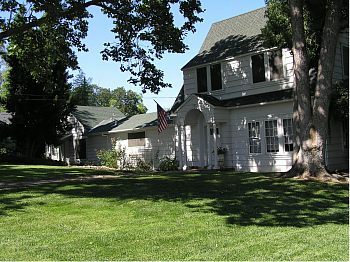 The main house has 3 bedrooms, 2 baths, dinning room and basement. There is a mother-in-law’s quarters containing 2 bedrooms and 1 bath. Presently, the owners share it as a "get-away" area. In the future, either of their mothers will be welcome to live with them! The former family, the Boldini’s from Chicago, upgraded the kitchen during their ownership. It is said that the chandelier in the dinning room came from Al Capone's home.